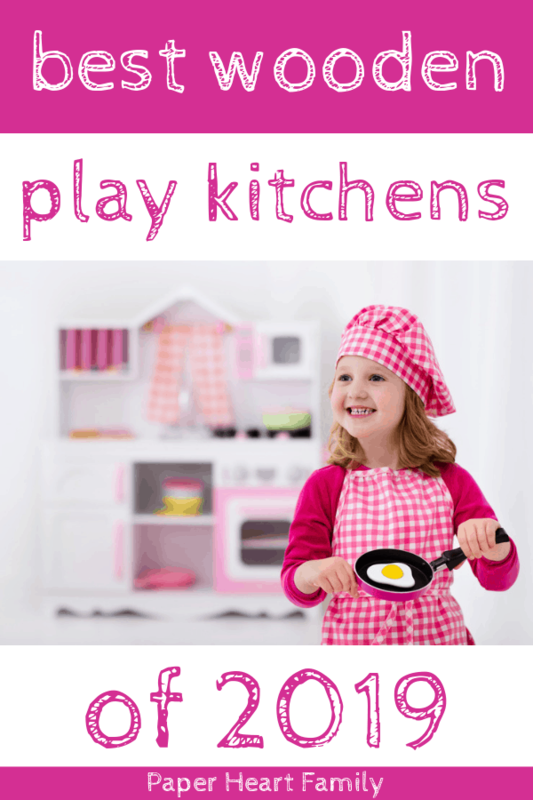 A play kitchen is just one of those toys that every child has to have. Deciding which play kitchen is the best can be a daunting task as there are SO many wonderful options. If you have decided on a wooden kitchen, this list will help you to decide which of the best wooden play kitchens is right for you. When I was a child, I had a plastic play kitchen. I loved it for sure, but my neighbor had a wooden play kitchen in his shed that used to belong to his children. It just sat in that shed for years and years, and I LONGED for that wooden play kitchen. I used to peak through the window and just stare at it. I used to imagine that it was mine and dream up elaborate play scenarios. There was simply something about it that was much more alluring than my plastic kitchen. Maybe it was simply the fact that it wasn’t mine, or maybe I loved that it looked so realistic. I don’t remember exactly why I loved that wooden kitchen, but I know that I did. Let’s take a look at why wood might be the best option for you, and then we’ll look at the best wooden options. If you’re just starting out the research process, you might be wondering which type of play kitchen is right for you and your family. In all honesty, it’s up to you and your personal preference. There is not one play kitchen that is right for everyone. Depending upon what you buy, this is a toss-up. Plastic doors can break off of a plastic kitchen. On the other hand, wooden kitchens are typically made of MDF (unless you are looking at a high-end wooden play kitchen). This wood can chip and if your children play with real water in the sink, you’ll want to make sure that you get a wooden option with a removable sink. Most plastic play kitchens have sounds and lights and electronic features. While there are a few wooden options on this list that do also, purchasing a wooden kitchen is going to encourage your children to use their imagination instead of having an electronic do it for them. On the other hand, if you would like some interactive features, many parents add battery-operated touch lights to their children’s play kitchens to give them some lighting. You can add them under the cabinets, in the fridge or in the oven. There are also a few wooden play kitchens on this list that also include interactive features, lights and sounds. This one was a big deciding factor for me. If you would like to keep your child’s play kitchen in a main area of your house (such as the kitchen), you will want to go with a wooden option. It looks much more realistic and is easier to match your decor. These wooden kitchens also don’t come with stickers that you have to apply perfectly. Stickers on plastic toys typically make the toy look cheaply made. These wooden kitchens have painted on features instead, which are much more pleasing. Some kitchens, such as kitchens made by Teamson Kids are made using green-engineered wood and non-toxic paints. Wooden play kitchens are much more classic-looking and therefore will maintain a high resell value. Plastic play kitchens tend to become outdated quickly. One of my biggest pet peeves with the plastic toy kitchen that we had previously was that there was NO room to store foods and utensils. Wooden kitchens tend to have much more storage space than plastic kitchens in order to hold all of your play kitchen foods, accessories and utensils. Unless you are buying a high-end wooden play kitchen, plastic and wooden play kitchen prices are very comparable. You shouldn’t think that buying wood is going to necessarily be more expensive. This kitchen is perfect for: The family looking for a smaller kitchen for a smaller space or a younger toddler. This kitchen is also perfect if you’re on a tight budget, as it is an inexpensive option. Don’t you love the look of this vintage kitchen? I think the best feature of this kitchen is its appearance. It is quite possibly the cutest kitchen on this list. Its vintage features will have you thinking that you’re back in your grandmother’s kitchen. This smaller play kitchen is perfect for the youngest toddlers who love to cook. However be aware that you will likely have to upgrade to a larger kitchen later as your child grows. The fact that this kitchen is one of the most inexpensive wooden kitchens that you can buy makes this fact a little easier to love. Once your toddler grows, you’ll be able to sell this kitchen easily for a great price and upgrade to a bigger, more appropriate-sized kitchen. Product Dimensions: 33″L x 13″W x 35.70H. The counter height is 18 inches. This kitchen is also available in both pink and blue. Perfect for: Families looking for a gender-neutral, inexpensive, larger option. For a more modern, gender-neutral option, the KidKraft Uptown Espresso Kitchen is a great kitchen. I love the little details, such as a chalkboard on the freezer and a side towel bar. Materials: MDF, solid wood and plastic. Product Dimensions: 42.5 x 17.1 x 41 inches. The countertop height is 22 inches. Perfect for: Families who appreciate a money-back guarantee and unique kitchen features. Knowing that this kitchen comes from the well-loved toy brand Melissa And Doug definitely means something. Melissa And Doug is a fantastic company created by a husband and wife, and they offer a 100% happiness guarantee on this product. This kitchen has a lot of fun features for the price, which make this one stand out from some of its competitors, including a working ice dispenser, reusable grocery list, a sizable height and fairly quick assembly. Perfect for: Families with limited space. Unlike most play kitchens, this model features a separate kitchen and refrigerator instead of an all-in-one design, which makes it appear more realistic and versatile. It’s a more compact play kitchen which is perfect for smaller spaces. Perfect for: Families who are looking for the highest-quality play kitchen for their child. Of course Pottery Barn Kids has a fantastic reputation of creating quality, durable products, and their play kitchen collection is no different. It’s beautiful, versatile and unique. The separate pieces of this set can be purchased separately as well which can help to disperse the cost. The retro kitchen collection comes in 3 separate pieces. The sink has under the sink storage and open side storage. It also has a towel bar. The separate oven and stove has two towel holders and a ticking timer. The refrigerator and freezer have a shelf and faux thermometer. The entire kitchen set is EXTREMELY realistic looking. It’s seriously gawk-worthy. It’s basically a smaller version of a real-life retro kitchen will all of the modern amenities that you could ever want. The three pieces can be purchased separately or all together, and are sealed with lacquer in order to resist moisture and chipping. There are also other optional pieces to the set, including a washer and dryer. Perfect for: Families looking for an inexpensive play kitchen with all the features. There is something about this kitchen that is so alluring. It’s definitely the most unique looking play kitchen that is available. It looks like a kitchen that you would see on a Food Network cooking show. I love that it has more than enough storage and counter space, and that it comes with accessories (it’s the only one on this list that does). It also has a lot of fun interactive features like a cooktop and sink that lights up and makes sounds. The included accessories are three chop-able carrots, three beets, a cutting board and pretend knife, two collapsible fabric storage bins, two containers for an herb garden, three ice cubes, one pot, one pan and one spatula. It is also one of the tallest play kitchens that you can buy and it is the highest rated play kitchen by Amazon reviewers. Product Dimensions:44.2″ L x 13.6″ W x 43″H. The counter height is 22.5 inches. Perfect for: A child who would love a more realistic looking kitchen with a washer included. The KidKraft Ultimate Corner Play Kitchen maximizes playability with the addition of a washer. While this might seem weird to you, I can guarantee that it won’t be weird to your child. She will simply love the additional play option. This corner kitchen has sounds, lights and plenty of counter and storage space for ultimate kitchen fun. This kitchen also comes in white. Our pick has been chosen due to ease of assembly, included features, price, rating, storage and counter space and more. We believe that this is the best wooden play kitchen available. What do you think is the best wooden play kitchen? I would love to hear your thoughts in the comments!